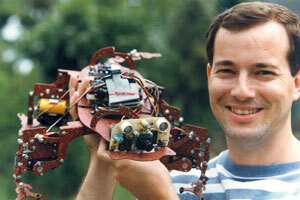 I started Arrick Robotics in 1987 with $1K. The goal was to make a full time living building robot-related products. The company is small and I do all of the engineering including the mechanical design, electronics, software, user guides, and even the website. There have been several tough years, but for the most part it's been successful and fun. Surprisingly, keeping a high-tech business alive for 20+ years is much harder than designing robots! This is my first attempt at designing and building an industrial-grade robot arm - 1988. SA4 was driven by stepper motors and controlled by a multi-processor backplane using Z80s. The prototype was wire-wrapped and I wrote all of the code in assembly language. Sadly, I couldn't muster the funds to bring it to market, but the long-selling MD2 motor control system was born from this research. Founded in 1984, the Dallas Personal Robotics Group is one of the oldest and largest robotics interest group around. In 1993, I became president after being disapointed that the group had dwindled to 5 people. To boost membership and participation, I published a monthly newsletter and started a contest which later that year drew a large room full of folks. The DPRG today has a great website and even a building which offers tools and space for robot builders. ARobot is my effort at producing a real programmable robot that is expandable and affordable, and isn't made out of plastic or driven by a dinky hobby servo. 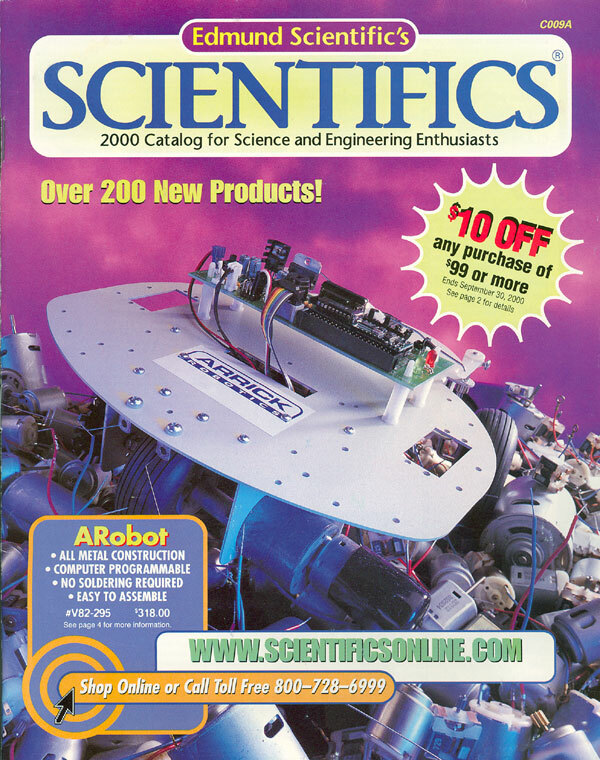 ARobot has made it to the front cover of the Edmund Scientific catalog, is the focus of the Robot Building For Dummies book, and has been featured or mentioned in several other robot books - 1, 2, 3. Here's my first shot at a 4-legged walking robot using only 2 servo motors. Walking action is controlled by controlling roll and yaw of 2 body sections along with legs that are compliant in 1 axis and interact via spring connections. In the mid-90s, most small walking robots were hexapods. Since I don't like doing things normal and enjoy a challange, I created a 4-legged walker which uses fewer motors, but requires some fancy design. The controller is an 8052 programmed in assembly for real-time servo sequencing. The feet are compliant, the head moves, as does the tail. The Gecko never made into production due to economics, time limitations, and ADD. Dbot is a robot I built while president of the DPRG. It used a real 386 PC motherboard, CRT, keyboard, and floppy drive which made the software development cycle much faster and allowed common high-level langauges such as QuickBasic. Dbot controlled its skid-steer motors via a custom MOSFET H-Bridge connected to a parallel printer port. Writing a book is not all it's cracked up to be. I might do another someday, but next time, I'll write it first then shop for a publisher, not the other way around. Robot Building For Dummies describes how to build an ARobot mobile robot and add sensors for temperature, light, and obstacle avoidance, along with other expansions. 1-Bit is a robot I built to show how an unexpectedly simple design can perform a fixed function that would typically require a programmed microcontroller. It's main purpose was to encourage robot builders to participate in the DPRG's first robot contest. Here's a robotic disk machine I built for a customer who wanted to computer control a floppy diskette drive. It can automatically load a diskette into the drive, tilt the drive to one of two different exit locations, and eject the disk, all under computer control. Multiple robots can be daisy-chained. Check out the premier Robot News site on the net - Robots.net. I have the honor of being part of the founding of this award winning site along with Steve and Jim. Robots.net is also the host of the revamped RoboMenu which I started back in 1995 to allow robot builders to show off their creations. The site enjoys first-page Google ranking for many robot-related search texts.